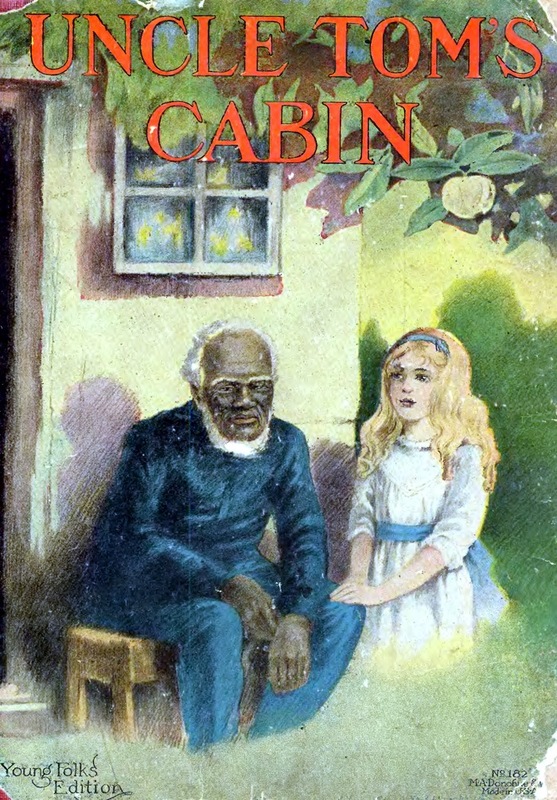 Harriet Beecher Stowe's adaptation for children, Uncle Tom's Cabin, Young Folks' Edition was published in 1913. It is featured in our collection of Books for Young Readers. Her original landmark book, Uncle Tom's Cabin , was published in 1852. One of the saddest things for the poor slaves was that they could never long be a happy family all together--father, mother, and little brothers and sisters--because at any time the master might sell the father or the mother or one of the children to some one else. When this happened those who were left behind were very sad indeed--more sad than if their dear one had died. 'He hasn't done anything--it isn't for that. Master don't want to sell; but he owes this man money. If he doesn't pay him it will end in his having to sell the house and all the slaves. Master said he was sorry. But missis she talked like an angel. I'm a wicked girl to leave her so, but I can't help it. It must be right; but if it an't right, the good Lord will forgive me, for I can't help doing it. The great piece of ice pitched and creaked as her weight came upon it. But she stayed there not a moment. With wild cries she leaped to another and still another--stumbling--leaping--slipping--springing up again! 'Oh, save me--do save me--do hide me,' she cried. Aunt Chloe had been up very early. She had washed and ironed all Tom's clothes, and packed his trunk neatly. Now she was cooking the breakfast,--the last breakfast she would ever cook for her dear husband. Her eyes were quite red and swollen with crying, and the tears kept running down her cheeks all the time. But Mrs. Shelby did not seem to see Aunt Chloe's angry looks. 'Tom,' she said, turning to him, 'I come to--' she could say no more, she was crying so bitterly. She dreamed of a beautiful country--a land, it seemed to her, of rest--green shores, pleasant islands, and lovely glittering water. There in a house, which kind voices told her was her home, she saw Harry playing happily. She heard her husband's footstep. She felt him coming nearer. His arms were around her, his tears falling upon her face, and she awoke. Mr. Shelby had trusted Tom in everything, and Tom had always been careful of his master's money--as careful as if it had been his own. Waste seemed dreadful to him, and he tried to do something to stop it now. 'Law, you niggers,' she would go on, 'does you know you's all sinners? Well, you is; everybody is. White folks is sinners too--Miss Feely says so. But I 'spects niggers is the biggest ones. But ye an't any of ye up to me. I's so awful wicked, there can't nobody do nothin' with me. I 'spects I's the wickedest crittur in the world.' Then she would turn a somersault, and come up bright and smiling, evidently quite pleased with herself. Legree made his slaves unhappy in every way he could think of. Then he would come up to them and say, 'Come, come, I don't allow any sulky looks. Be cheerful, now, or--' and he would crack his whip in a way to make them tremble. The bell rang--the boat stopped.